More sellers are feeling optimistic about listing their homes just as humidity, cabin weekends and food-on-a-stick give way to rakes, school buses and sweater vests. Compared to last August, Twin Cities sellers listed 7.6 percent more homes on the market. That was the largest increase since late-2015. Although buyers signed 2.9 percent fewer contracts than last year, they did manage to close on slightly more deals. 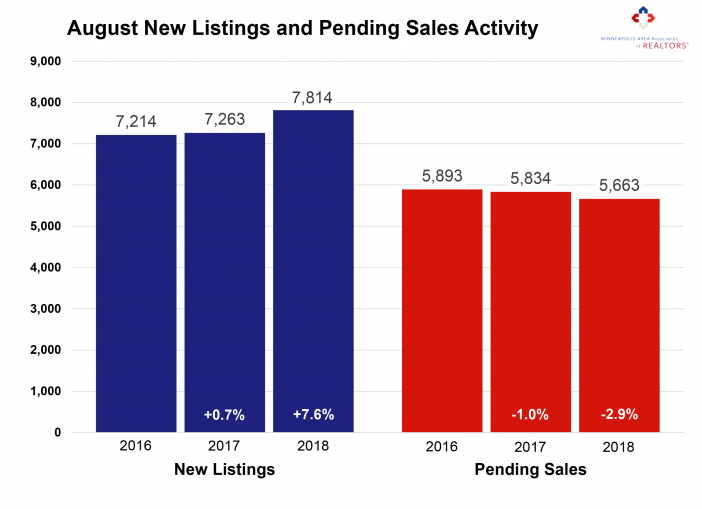 Three of the last four months had increases in new listings; three of the last four months had decreases in pending sales. This trend of rising seller activity and moderating buyer activity suggests we could be approaching those long-awaited inventory gains. Sure enough, the 7.8 percent decline was the smallest decrease in inventory in over three years. Months supply was down just 3.8 percent to 2.5 months. That said, today’s buyers still face plenty of competition over limited supply. Sellers yielded an average of 99.2 percent of their original list price and 100.1 percent of their current list price, illustrating how drastically undersupplied markets tend to favor sellers. The shortage is especially noticeable at the entry-level prices, where multiple offers and homes selling for over list price have become commonplace. The move-up and upper-bracket segments are less competitive and—for the most part—much better supplied. The market remains relatively tight, but there are some early signs that things could be loosening up for buyers. Changing demographics, income levels, corporate growth and natural disasters all affect residential real estate markets. Home prices in Seattle and San Francisco have increased amidst e-commerce and technology success stories, while listings and sales decline precipitously when a hurricane strikes. This week, we are reminded of the destruction delivered by Hurricane Harvey to Houston at this time last year. From Katrina to Sandy to Maria to Florence, housing markets have bent but remain unbroken. In both academic and conversational circles, more people are beginning to discuss 2018 as the end of the freewheeling days of residential real estate – with its high prices and fast sales, site unseen. Such a portrayal of the last several years of the housing market are sensationalistic at best, patently false at worst. It is true that median sales prices have risen and total days on market have lessened. This prevailing market trend has occurred gradually, and so shall the next trend. It has been another busy summer for residential real estate. The lower supply, higher prices, faster sales mantra has remained in place for most of the nation for the entirety of the year – which heightened in intensity during the summer sales season – but there has been some conversation about the possibility of more supply and lower prices. Presently, it is just conversation, as the numbers are not reflective of a shift in trend lines anytime soon.